A new survey found SNAP enrollment down 10 percent among immigrant families. Officials are pointing to a new "public charge" rule under President Donald Trump, that would change what factors immigration officials consider when deciding if applicants qualify for a visa or permanent resident status. The rule says that applicants seeking to live in the U.S. from other countries or immigrants seeking to stay permanently should be denied if they will rely too heavily on government services, such as government housing, subsidized health care or food stamps, known as the Supplemental Nutrition Assistance Program or SNAP. (Richard B. Levine) A sign on a sales rack of an energy bar in a 7-Eleven in New York on July 27, 2014 promotes the convenience store's acceptance of the SNAP (Supplemental Nutrition Assistance Program) formerly known as EBT, replacing half of the food stamp benefits received with a food delivery service tentatively called "America's Harvest Box". "It's not like things were hunky-dory for immigrants before then, and now it's just gotten so much worse," said Joel Berg, head of Hunger Free NYC, of the administration's new "public charge" rule. "So you take people that are already scared and are coming from countries and are scared of their government -- for good reason -- and throw this on top of that, and it's truly a massive calamity." The Homeland Security Department, which oversees immigration, estimated in a proposal that 2.5 percent of immigrants in the U.S. -- more than 500,000 people -- would disenroll from public programs because of the change. A new survey from the nonpartisan policy group Children's HealthWatch found that even though more immigrant families reported they don't have access to healthy food on a regular basis, SNAP enrollment among immigrant families in the U.S. less than five years is down about 10 percent. The lead researcher Allison Bovell-Ammon said mothers born outside the U.S. reported "extreme caution" in participating in food-assistance programs. (Spencer Platt/Getty Images) Employee Shawn Lewis moves pallets of food at the Food Bank for New York City in the Bronx neighborhood of Hunts Point on June 7, 2017 in New York. And Rodrigo Aguirre, a case worker at the Spanish Catholic Center in Washington, said about half the families he talks to aren't comfortable applying for benefits. He said that mothers, especially, are afraid their information will be shared with Immigration and Customs Enforcement, and that they could be separated from their children who were born in the U.S.
Stephen Knight, policy and partnerships director for the Alamada County Community Food Bank, said one woman called and asked for her mother’s name to be removed from the food bank's database. He said she was afraid her mother would be deported because she accepted free food from the food pantry, even though it isn't connected to government programs. "This is a blunt instrument -- it's spreading hunger among an incredibly vulnerable population, and it's just really an unacceptable public policy," Knight said in an interview with ABC News. "All of us are struggling to try to counteract the fear that is coursing through these communities." Jessica Vaughan, director of policy studies at the Center for Immigration Studies, which supports the Trump administration's proposal and favors reduced migration to the U.S., said there's a lot of misinformation and hysteria about the policy change. She said she's seen reports of people dropping out of programs, but it's hard to pinpoint one reason for the trend and that some people might be self-selecting out of those programs. "The rule does not aim to deny benefits to U.S. citizen children or others who might qualify for them," she said. "Its purpose is to create a better way to evaluate which applicants for immigration benefits are going to qualify by showing that they're self sufficient." Vaughan, a former consular officer who would evaluate visa applications, said caseworkers typically will look at an applicant's overall situation and that they wouldn't approve or deny a request only because they used food stamps or other programs. "It would be one thing if you were getting every program on the books, and some people need that, but if they do they're not going to be eligible for a green card unless their total family resources are going to change so they will not need those resources any more," Vaughan said. Agriculture Secretary Sonny Perdue, whose department administers SNAP, said he would be concerned if legal residents were dropping out of programs intended to provide food and that when it comes to women and children we should "lean on the side of compassion." (John Moore/Getty Images) Brooklyn residents receive free food as part of a Bowery Mission outreach program on Dec. 5, 2013 in New York City. 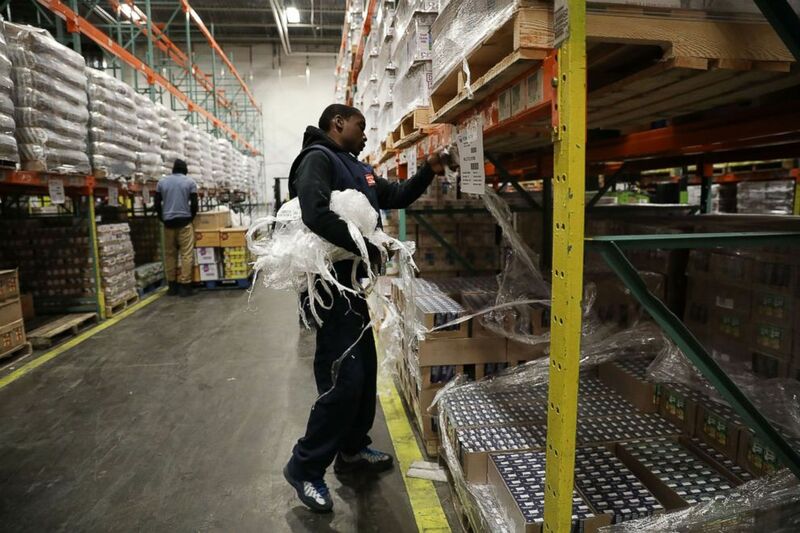 Food banks reported an increase in need after cuts were made to the Supplemental Nutrition Assistance Program (SNAP). 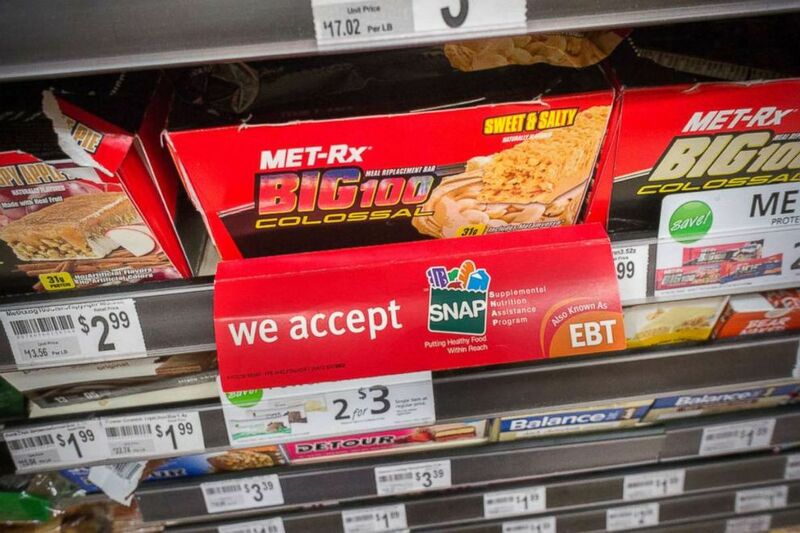 The Food and Nutrition Service, which manages SNAP and other programs, "wants to ensure that all individuals eligible for our programs have access to the nutrition assistance they need to live healthy, productive lives,” according to a USDA statement. But anti-hunger advocates say that promise isn't enough and that because of fear, hunger is spreading in vulnerable communities. Eighteen percent of Hispanic households said in 2017 that they didn't have enough healthy food to eat on a regular basis, according to the Agriculture Department. "You're asking someone to choose between their immediate needs, and the immediate needs of their kids, and the ability to stay in this country legally for the long term," Celia Cole, a policy expert with Feeding Texas, told ABC News. "You're asking people to choose between their present and their future. It's horribly unfair."